Like most of my current obsessions, I blame Pinterest. Honestly, I have such a love/hate relationship with that site. While I adore and drool over the beautiful, artsy, stunning creations and pin, pin, pin until I'm bleary--I'm not a crafty girl. Truly. For instance, I found an adorable birthday banner on Pinterest and decided I needed to make it for both Kristen and Mikey's recent birthdays. Now, most people could whip those banners together in a heartbeat. Six hours. Times two. I lost 12 hours of my life creating birthday banners to hang for a day. Actually, Michael's banner still remains hanging from the mantle, although his birthday was April 18. I left it there as a cautionary tale, reminding me to stay away from Pinterest. 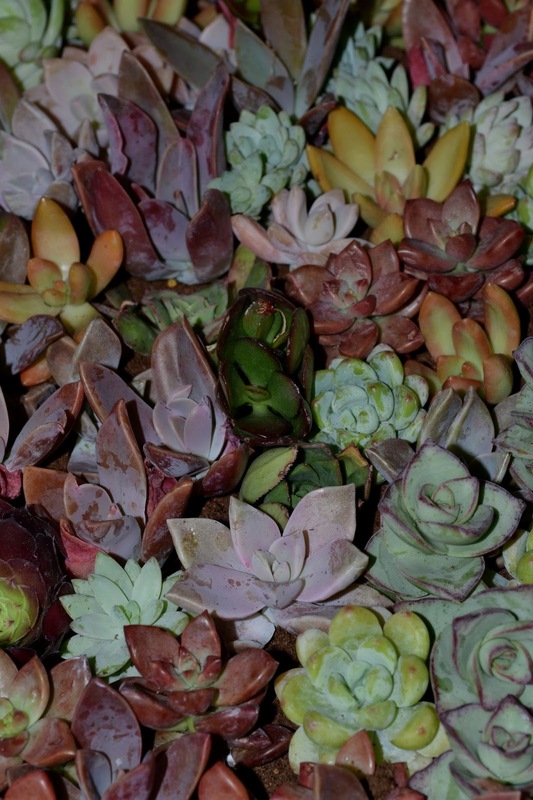 But then, in a moment of weakness, I stumbled upon a photo of a succulent wreath. The original Pin was from a Better Homes & Garden project. You can see it here. As I researched the steps involved in creating the wreath, my courage waivered. I thought of the birthday banner debacle. Fortunately, fate arrived in the form of a gift card from my sister to The Urban Planter--just as they announced openings for a succulent wreath workshop. Hooray! Not only would I have a support group to help me if my lack of craftiness usurped my gardening ability, but The Urban Planter would also provide all of the materials needed. No running out mid-project for more succulent cuttings. No prep work. No mess in my house. And an evening out with grown-ups? So last night, fueled with much Diet Coke, I joined the lovely owners of The Urban Planter, as well as three other gardening-obsessed ladies, to create my highly anticipated living wreath. The variety of succulent clippings provided was worth the price of the workshop alone. We each received a pre-made, pre-soaked sphagnum moss wreath form. If you're playing along at home, you can build your own wreath form using mesh tubing stuffed with moss, a wire wreath-shaped frame, and fishing line to tie the tubing onto the frame.The pre-made form also included a chain for hanging the wreath, as well as "feet" to keep the wreath from laying flush against the door. If you make your own wreath form, you'll want to add plastic to the back of the wreath to prevent the moist wreath from damaging a wooden door. The only additional tools you'll need besides your clippings and the wreath form are a pencil (or similar sized object, like a chopstick) to poke holes in the wreath and possibly some pins to hold heavier cuttings in place. I only used a few of the pins. As with any container or floral design, think about form and colors when selecting and placing your clippings. I tried to use groupings of three--but I found I needed more groupings to fill the form, so I used groups of five. Select your cutting, removing any bottom leaves so that you have at least an inch of clean stem. Poke a hole in the form and insert the stem into the moist moss. If the cutting is heavy or hanging downward, you may want to add a pin to secure it. Poke holes, insert clipping, repeat. While the image on Pinterest is obviously packed full with succulents, you'll have gaps in your newly-created wreath, which will allow the succulents room to grow. Paul, the owner of The Urban Planter, created this stunner last night. Once you've filled your form with cuttings, allow the wreath to rest for a week or two before hanging to allow the cuttings to root. Lay it flat in indirect light. After a few weeks, you can hang your masterpiece. TA DA! A Pinterest project that only took 1-1/2 hours to create! And I didn't lose my sanity! I'm looking forward to watching how the wreath develops. I may find a few more succulents to sneak into the gaps--or I may just leave it alone and practice patience. Thanks so much to The Urban Planter for hosting this very fun workshop. If you live in Upstate SC and want to attend one of their workshops (or if you just want to find the most beautiful garden treats and living arrangements), check out their website for class schedules. Please tell Paul, Tara, and Becky I said hello! 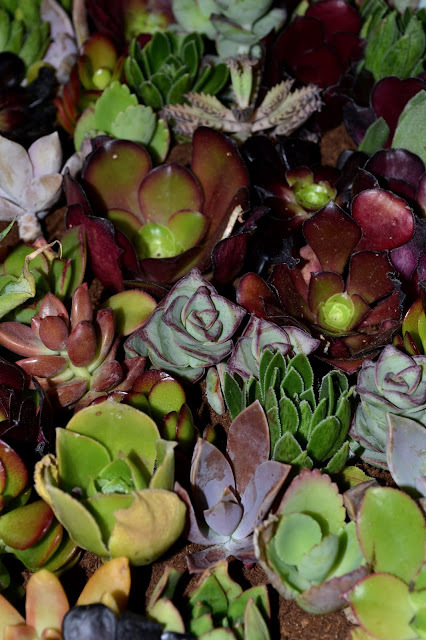 And, if you create your own succulent wreath, stop by my Facebook page and share a photo of it. I'd love to see what you make! P.S. Shared with The HomeAcre Hop and The Creative HomeAcre Blog Hop--check them out for more great ideas.